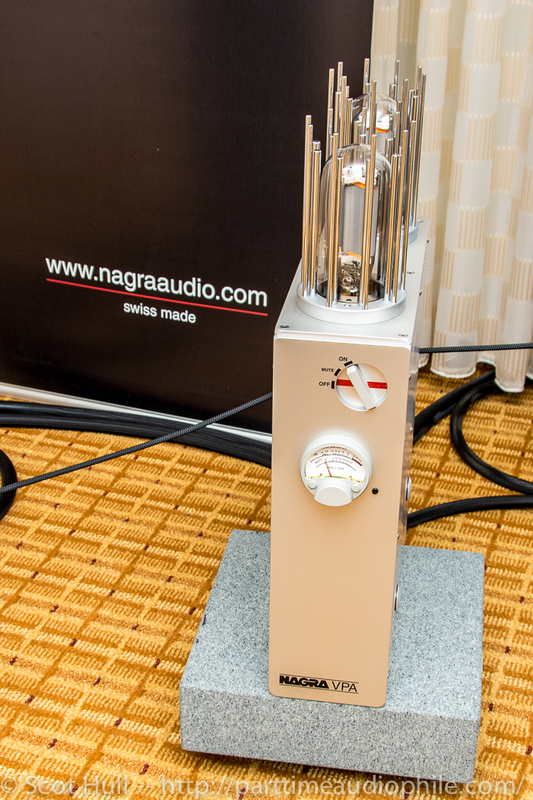 Audioarts of NYC has presented some of my favorite rooms at RMAF in years past, and this year they elected to exhibit on a Swiss theme with manufacturers Stenheim and Nagra. 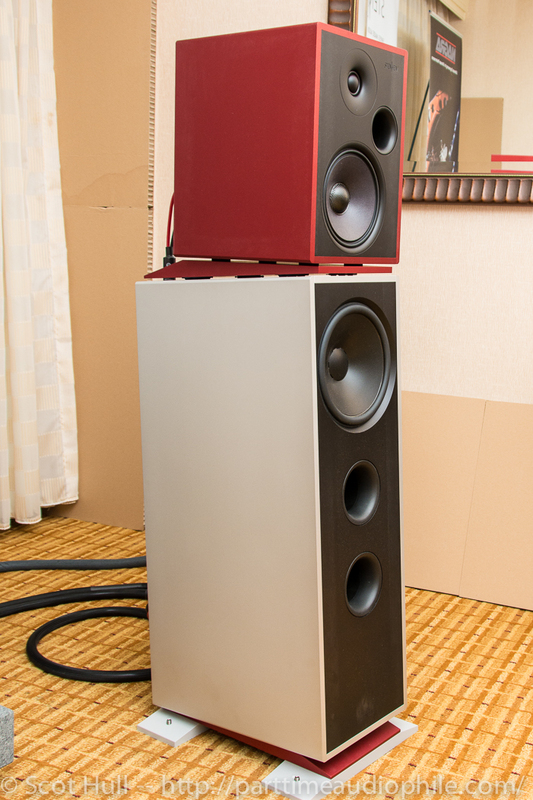 Stenheim’s Alumine speakers are stylistically squarely in my happy place. While my house might be cluttered with Tannoys and Altecs, not to mention strewn with stray shoes and dog toys, in my imagination I could totally live in a minimalist European loft with loads of Danish Modern furniture and these softly gleaming aluminum loudspeakers. 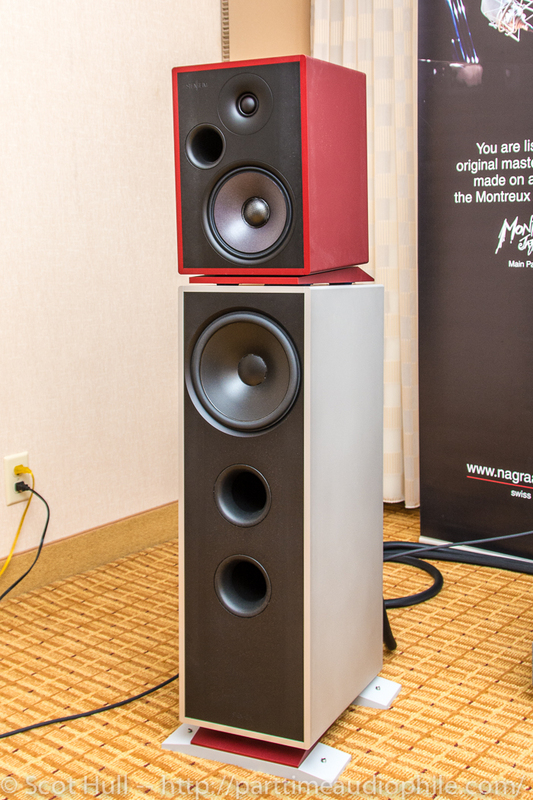 The top monitor section (pictured in red in the photo) can be purchased separately as a pair of stand mounts ($15,975), or paired as I heard them with a woofer section (an additional $29,750/pair). 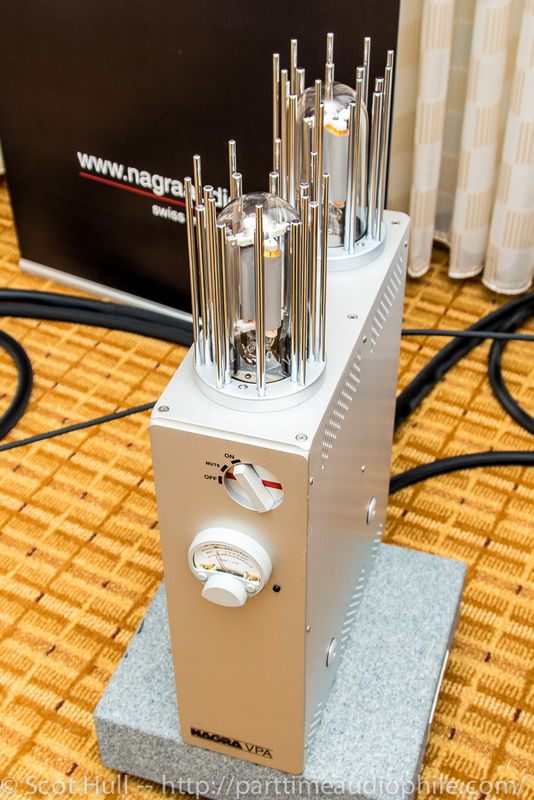 The Nagra gear is every bit as good-looking as then Stenheims, if a wee bit more baroque. 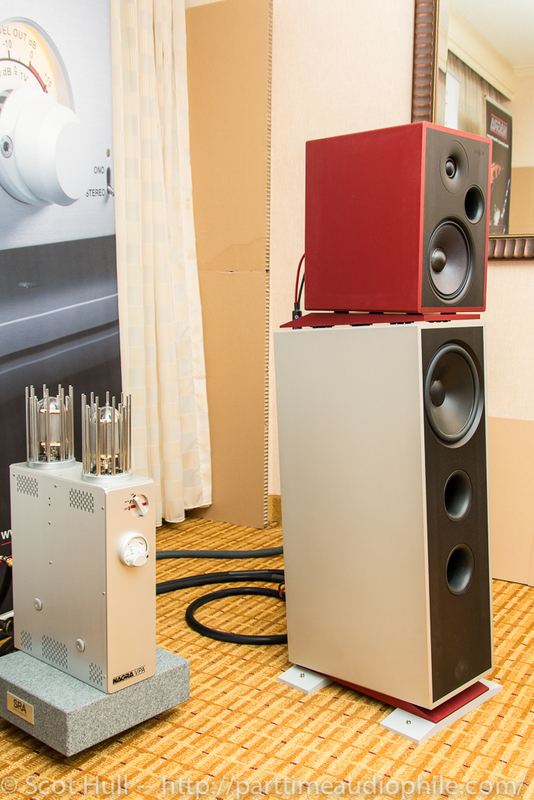 The VPA 845 class A monoblocks ($29,350/pair) feature tube shields that put me in mind of a silver-plated version of Saruman’s tower and offer 50 watts per channel. 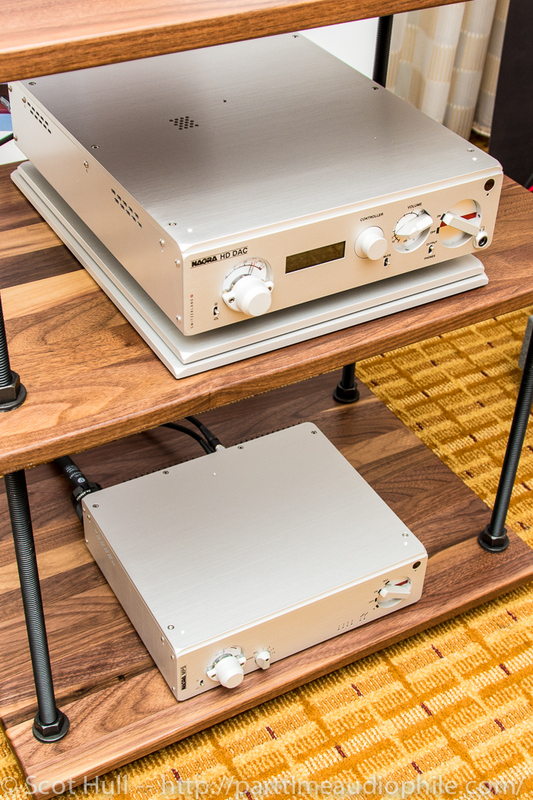 In comparison, the HD DAC with MPS battery power supply ($27,250) looks pretty tame. The source in this room was a laptop computer. Presented with opportunity to try out something from my thumb drive, I handed it over and we were quickly in business. I elected to play Lake Street Dive’s cover of “Rich Girl” from their 2012 ep Fun Machine. This track re-imagines the Hall & Oates classic as something of a jazz standard, with Rachel Price essentially singing a duet with Mike “McDuck” Olson’s trumpet. Price’s voice came out rich and strong, and the details on the backing vocals were particularly fine. In spite of this, I found the presentation curiously lacking in the energy I know it has; the vocals lacked a bit of edge, as did Olson’s fine trumpet work, and while the thump and slap of Bridget Kearney’s upright bass was there, it too seemed like it was missing some heft and wholeness. The track ended up sounding like straight-up elevator music, which was a disappointment. While it’s a laid-back groove, it’s not meant to be boring. 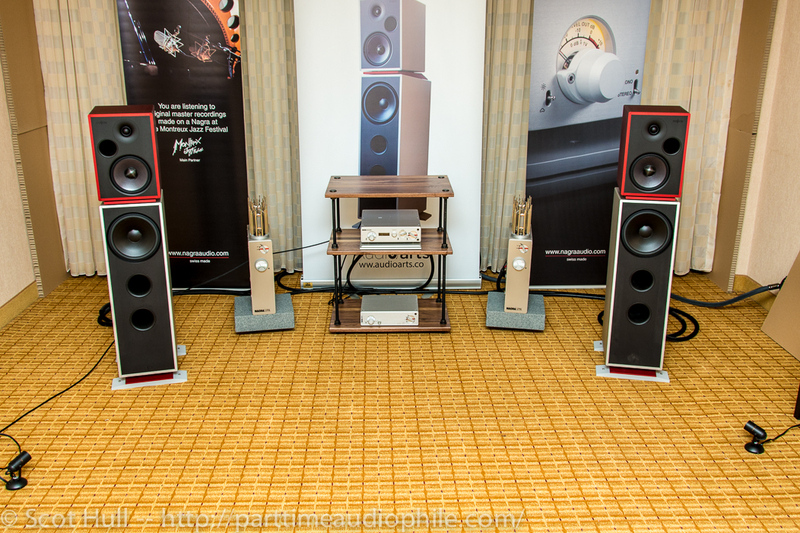 I suspect what it comes down to is that I am a sucker for immense dynamics, and while this system might visually be right up my alley, sonically it’s more like next door. I might like to visit sometimes, but I don’t think I’d want to stay.